My wife Rachel and our neighbor Barbara Kingsolver went to an OWS demonstration in Johnson City, TN, on Saturday. Check it out here. You can see part of the interview with Kingsolver in the “Related Video” window on the upper left. 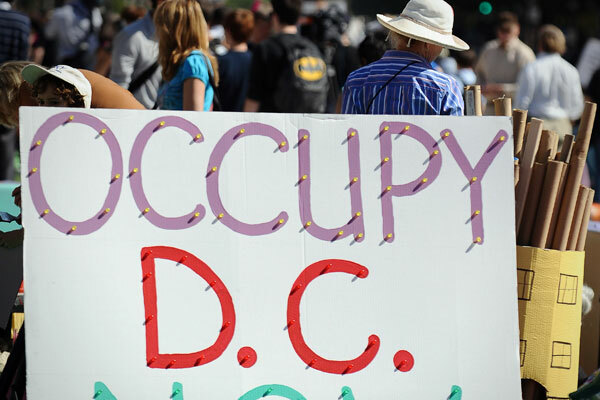 Below is an eyewitness account of Occupy Washington. The Occupy movement is spreading all over this country. Roger and I felt extremely moved by the encampment we joined in Washington, DC, from its first day, Thursday, October 6, 2011, through Saturday, October 9. People were well-organized, peaceful, angry, and determined to make their desires known. We found the hundreds of colorful signs dotting Freedom Plaza extremely entertaining. The first night we witnessed a large crowed making decisions by consensus. An excellent facilitator asked for proposals on the subject of where the demonstrators should sleep, limiting speakers to a minute apiece. People reacted with what I learned is called “sparkling”: hands in the air with fingers waving means agreement, hands pointed downward means disagreement. Through this process the many proposals were finally boiled down to one with two tiers. After much helpful clarification, especially by members of DC’s homeless population, it seemed that the plaza might be under federal jurisdiction, so sleeping there could lead to arrest by federal police. Sleeping on nearby streets might be less risky because the park police, or DC police, or transit police, or yet another of the many policing entities in our nation’s capitol, would be in control. As it turned out, around 300 people slept outside with no arrests at all. During the subsequent days, several marches took off down the street, at least once to another occupation in McPherson Square, and once to the Art and Space Museum in an ill-advised attempt to protest the current exhibit of drones there. When I first saw Bread and Puppet Theater in Chicago years ago, some of the actors, dressed in black, pretended to be bombers, with great effect; nowmembers portrayed even more threatening drones. On Saturday welistened to a talk on US national security policy by iinvestigative historian/ journalist Gareth Porter, participated in a workshop on economics for the people, and then had the great pleasure of hearing from Ralph Nader. He advised us to keep our focus and warned us not to be co-opted–because we are the 99%.The permit was supposed to end on Sunday, October 10, but the city has agreed to extend it for four months. Two groups are entrenched in Freedom Plaza and McPherson Square downtown. Protesters with the Stop the Machine and Occupy DC groups have erected tents and piled up boxes and other living materials as they hold meetings, decamp for marches and protests and otherwise traverse the city. In Freedom Plaza, Stop the Machine group organizer Margaret Flowers said Tuesday that the group and the National Park Service agreed to extend its permit to stay there through Dec. 30. At McPherson Square, Occupy DC protesters have said they have no permit and have not been bothered by authorities. In interviews Tuesday, eight of 13 council members supported the protesters’ presence. One of the beautiful aspects of the occupation is that it has brought people out into the open to talk about the issues. Everywhere we look right now as we gaze out at Freedom Plaza in Washington DC, people are engaged in conversations. Some are standing in groups, and some are sitting in circles in the assembly area or between the tents. This is the first step in this evolution to a more peaceful, just and sustainable planet. For too long we have been focused on divisions. Now we are finding what unites us. Increasing numbers of people are becoming unemployed, uninsured, losing their homes or pensions or dignity. Students are dropping out of college due to cost or graduating with lifelong debt in a deteriorating job market. The days of sitting in silence and blaming ourselves for not working hard enough are over. The first step in the process of change is awareness of the problem. We are encouraging all people to come out of their homes. Join us in the streets either through your local occupation or on the local playground. Talk to those around you. Talk about the way things are with increasing wealth disparity and poverty. Talk about the way you want things to be – a society based on openness, acceptance, honesty, transparency and kindness.Following are the 15 issues we’re working on. Please talk about them and share what you learn with your family, friends and colleagues. This is the first step in the nonviolent transformation of our country. This entry was posted in Bob Denham, Current Events on October 19, 2011 by Bob Denham.